A little house just got a big honor. 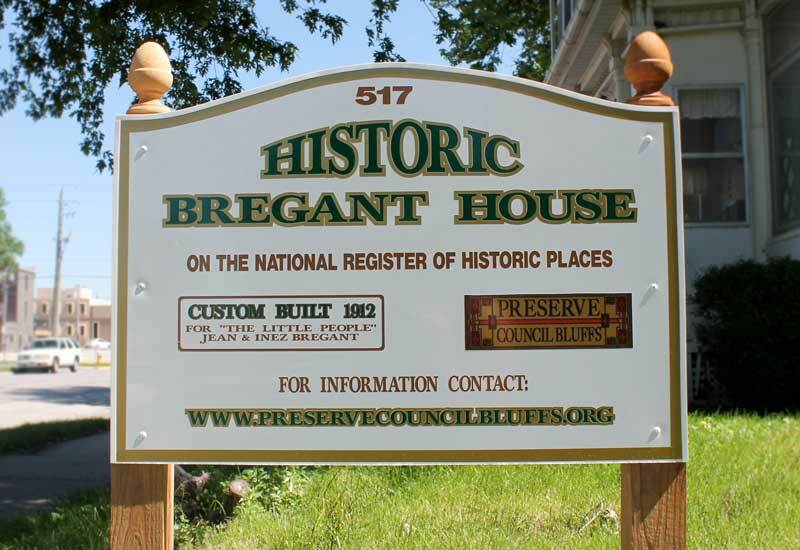 The Bregant House, the home of a famous little couple who met while performing on the same vaudeville program at Coney Island, N.Y. and then lived in Council Bluffs for years, has been listed on The National Register of Historic Places and is also designated as a Local Landmark. Recognition ceremonies were held Thursday evening at the house at 517 Fourth St. The house was the home of Jean and Inez (Lewis) Bregant, a diminutive couple who met during the days of Vaudeville. Jean grew to 45 inches tall and Inez grew to 41.5 inches tall. “They were not midgets or dwarfs, just little people,” said John Edwards, another member of the preservation group. Preserve Council Bluffs board member John Edwards, left to right, Pottawattamie County Community Foundation CEO Dawn Hovey, and Preserve Council Bluffs President of board of council Jim Kieffer pose for a photograph inside the Bregant House in Council Bluffs on Nov. 21, 2013. 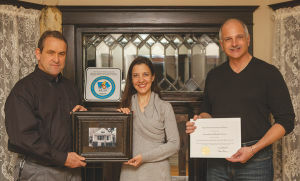 Kieffer is holding a certificate from the State Historical Society of Iowa certifying the Jean and Inez Bregant House as a National Register of Historic Places. After they were married, the couple moved to Council Bluffs where her parents operated a grocery store on Eighth Street. On a visit to the local Woodward Candy Co, to place an order for the store, the couple met the company founder, John Woodward, who hired them to be the company spokespersons. They were nicknamed the “Candy Kids” and ultimately had a twenty-state territory of their own. Their images were seen on advertisements and company products. After leaving the company, the couple operated the candy department at the city’s Beno’s store. Eventually, Jean became involved in real estate and community affairs. 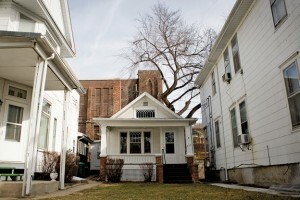 The smaller than average Bregant House in Council Bluffs, is considerably smaller than its neighboring houses along Fourth Street. The home was originally built to size for Jean and Inez Bregant who both stood under 48 inches tall. The Bregants lived in the house until their deaths – Jean in 1944 and Inez in 1969. The home, built in 1912, is described as a simple Craftsman Bungalow, popular in the early part of the 20th Century. Ceilings and doorways were built to normal height for when normal sized friends came to visit the Bregants, but the fireplace, bathroom fixtures and kitchen appliances were scaled to fit the small couple. A $1,500 grant from the Pottawattamie County Community Foundation provided the funding to seek admittance onto the history register.